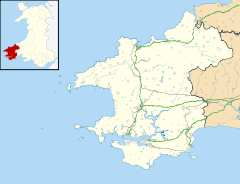 Uzmaston is a small parish in Pembrokeshire, Wales, about 2 kilometres south-east of Haverfordwest. The village forms part of the community of Uzmaston, Boulston and Slebech. Its parish church is dedicated to the 6th-century Breton prince and Welsh saint Isfael. ^ "GENUKI: Uzmaston". Retrieved 16 February 2016. Wikimedia Commons has media related to Uzmaston.